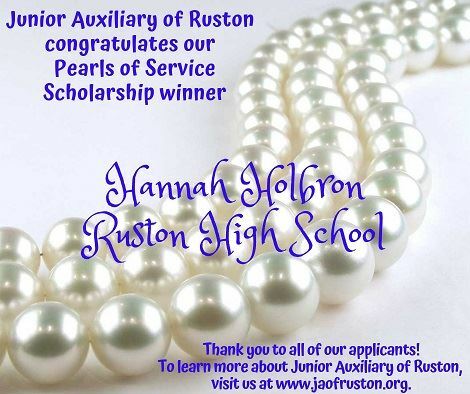 The Junior Auxiliary of Ruston (JA of Ruston) is making one (1) $500 scholarship available to 2019 graduates of Lincoln Parish High Schools. Application forms are available through the guidance office at all high schools in Lincoln Parish. Completed Applications must be post-marked/submitted by March 15, 2019.  Recipient must be a Lincoln Parish resident and be a senior at a high school in Lincoln Parish.  Applicant will have maintained an overall 2.5 GPA. (will need to provide enrollment verification before scholarship is awarded).  Recipient will be selected from Scholarship Application Forms submitted by eligible students.  Recipient will be chosen by an impartial panel selected by the Scholarship Chair.  The Pearls of Service Scholarship recipient will be submitted to his/her high school. It is the decision of each school to recognize recipient at graduation/awards ceremony. A committee comprised of Chapter Members will judge the applications and contact the winners no later than March 31, 2019.